Waze, the GPS-based navigation app aka every driver's best friend, conducted an evaluation back in 2015 which concluded that Metro Manila has the worst traffic on Earth. You read that right, we have the worst traffic situation in the entire planet! So my 30-minute drive (on average) from home to the office is considered a privilege if compared to my colleagues coming from the North. Venturing out of my comfort zone, Makati is one city that I usually avoid especially on Fridays, when its raining and/or when I'm driving. On the rare times that I really have to go, I just take Uber or make sure that I'm just a passenger in somebody else's car. 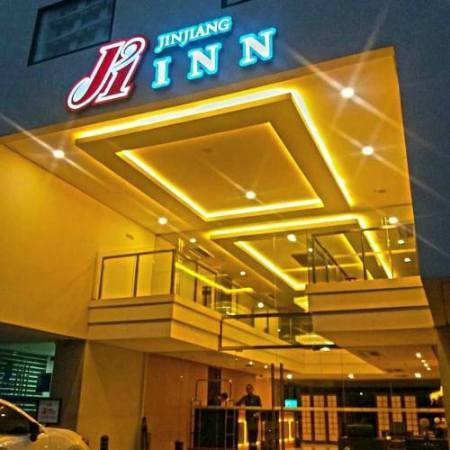 When I chanced upon a great deal on Jinjiang Inn thru Agoda, I knew I'd be crazy to let it pass. Besides, it was a great jumping-off point to delicious food around Makati with the hotel's convenient location just along Pasay Road and a mere 5-minute walk to Greenbelt Mall. As soon as the Uber car pulled up in front of the hotel, a guard instantly went to my direction to ask if I was a guest of the hotel and led me towards the lobby. The male staff verified my reservation and asked Php2,000 deposit for incidentals, which was refundable upon check out. After getting my key cards, I went up to my room located on the 3rd level and facing Pasay Road. Occupancy was high so my request to switch rooms to evade the noise downstairs was denied. The well-appointed business room that we booked had a spacious 26sqm floor area, probably one of the bigger standard rooms that cost under Php3,000 per night if compared to its neighboring hotels. Room amenities include a king size bed, a window-type aircon, a cable television, bedside tables with alarm clock and telephone, writing desk, coffee and tea maker, a fully-stocked mini bar, bathrobes and slippers, an in-room safe and an equally roomy toilet and bath.